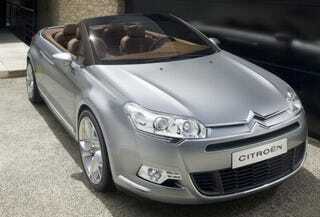 Citroën is unveiling C5 Airscape at the 2007 Frankfurt Motor Show. This exceptional concept car is a new take on the most beautiful of vehicles, the cabriolet. C5 Airscape features powerful, dynamic exterior styling and an interior of exclusive design, made for driving pleasure and the comfort of three passengers. The original mechanism of the folding roof underlines the overall sophistication of design. Styled for maximum appeal, C5 Airscape also delivers maximum performance. New-generation Snow Motion traction control provides a level of traction close to that of a four-wheel drive. Other useful features are provided by the UrbanHybrid system. This unit prevents noise and vibration when the engine stops and boosts engine torque when needed. At the same time, it shows real respect for the environment. A car of elegant lines, C5 Airscape conveys an impression of strength and sophistication, with its cleanly drawn body lines and ribbing at the top. The powerful look of the body is brought out by the raw, intense grey of the bodywork. This colour, whose intensity varies according to the light, gives C5 Airscape an elegant and precious look, consolidating its status as an executive vehicle. Through its assertive front end, featuring large air intakes and long incisive headlamps, C5 Airscape makes a statement of performance. The headlamps - positioned on the bonnet with its two pronounced ribs - flank the large chrome chevrons stating Citroën's identity. The profile of C5 Airscape reflects efforts to achieve optimal aerodynamic design. The roof line, particularly large windows and tapering chrome-plated door handles underline the flowing lines of the body, while the high waistline, clearly marked wheel arches and 19-inch wheels clearly identify C5 Airscape as a vehicle of status. The powerful design of the front and rear ends highlight the on-road stance of C5 Airscape. The highpositioned rear lights extend the waistline and optimise the vehicle's dynamic looks. At the same time, a double chrome tail pipe underlines the car's luxurious design as does the concave rear window, which clearly identifies C5 Airscape as belonging to the family of large Citroën saloons. The sophistication of C5 Airscape can also be seen in the original design of the folding roof, whose glazed upper part lets light flood into the cabin. Made entirely of carbon, this roof opens and folds away simply, without detracting from the looks of the concept car. It folds away automatically, without assistance, and without the driver having to open the upper part of the roof storage area in the boot. C5 Airscape reflects the purest traditions in vehicle design in that the metal-look roof with its textile lining resembles a roof made of canvas - the emblematic signature of executive cabriolets. Fully upholstered in dark brown leather, the cabin of C5 Airscape conveys an appealing impression of sophistication. The particularly well designed seats suggest luxury and precision. The central section of the seats brings to mind the links of a watch strap, while the decorative stitching on the edges of the seats reinforces the taut, well-muscled look of the whole. To add the finishing touch to the executive design of the interior, the gear lever knob is set with leather and chrome. The chrome echoes the metal strip underlining the air conditioning controls and central console. The design of the driving position on C5 Airscape was also dictated by the pursuit of driving pleasure. Refinement is the key word for the driver's surroundings, as reflected in the specific design of the instruments and their layout. The driving position features a fixed-centred controls steering wheel that brings the main comfort functions and driving aids (navigation, radio, cruise control and speed limiter, on-board computer) within easy reach. Considered as points of contact, the pushbuttons feature an original covering resembling the texture of skin. They create a strong, fast-reacting sensory interface between the vehicle and the driver. The sophisticated design of the instrument cluster on C5 Airscape reflects the requirements of optimized ergonomics and ensures that information is laid out legibly. The three dials feature annular needles, symbolising an advanced level of technology. The needles run around rather than across the dial for greater legibility and a more attractive design. The air vents next to the dials underline this cabriolet's powerful character, as does the upper part of the instrument cluster, which takes the form of an air intake as on a competition car. The overall effect is enhanced by the clean, sculpted design of the dashboard. Its straight lines symbolise precision, while the soft curves symbolise dynamic performance. This configuration contributes to full driver control and exceptional driveability. Styled for maximum appeal, C5 Airscape also delivers maximum performance. This concept vehicle is equipped with a V6 HDi engine associated with a particulate filter and able to run on biodiesel, along with an innovative Snow Motion traction control system for a performance close to that of a four-wheel drive, and UrbanHybrid technology for low fuel consumption and CO2 emissions. As a result, C5 Airscape boasts remarkable levels of performance that show real respect for the environment. Through its powerful engine, particulate filter and UrbanHybrid system, C5 Airscape illustrates Citroën's ability to reconcile vehicle performance with respect for the environment. With its reversible alternator-starter and super-capacitors able to temporarily store large amounts of energy, the UrbanHybrid system delivers real benefits in terms of environmental protection, driving pleasure, acoustic comfort and vibration control. In Drive mode, when this concept vehicle is travelling at under 6 kph and the driver's foot is on the brake pedal, the engine cuts out. For maximum driveability, it starts again instantly and automatically as soon as the driver releases the brake pedal. When the car is at a standstill, fuel consumption is zero and CO2 emissions are around 24 g over a combined cycle. Further, the onboard network (air conditioning, radio etc.) is powered by energy recovered during the deceleration and braking phases. This brings savings in fuel consumption and eliminates additional pollutant emissions. Engine torque can be temporarily boosted, when overtaking for example, for a high-speed take-off. When the car is at a standstill, the UrbanHybrid system prevents noise and vibration in the cabin, for the comfort of both passengers and passers-by.